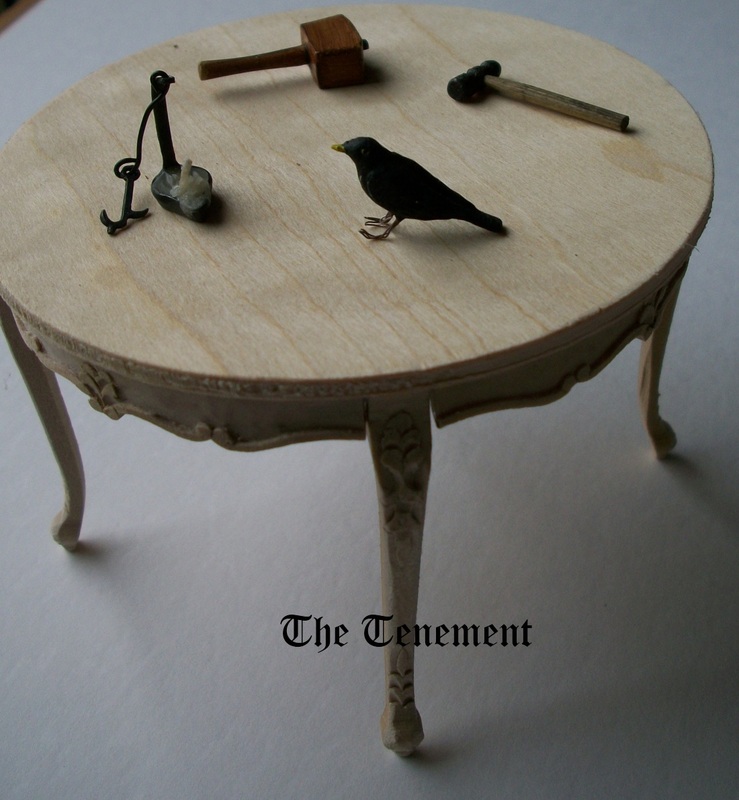 The Tenement: I've found my table. After a prolonged search for this particular table I actually managed to find it. If I was going to be true to the RL Green Room, this table had to be round with detailed Queen Anne legs. You've no idea how difficult this table was to find. It's taken me almost a year. There are square ones, rectangular ones and oval ones - all with Queen Anne legs but no round ones - until Miniatura, that is. There's a pedestal table in the room at the moment which is fine for period but it wasn't exactly what was required and until that elusive table had been found, I was never going to be 100% happy. Now I am! Perfect. Other little items purchased for The Tenement are the most marvellous blackbird I've seen, a non-working cruisie lamp, a hammer and a mallet. Love the bird! :D That table is beautiful, too! Well done on the table - not only a great find but a real success in keeping the room true to the RL one. Beautiful blackbird! Who's artisan for this item? Firstly, welcome to my blog Blanche. It's nice to see you here. Secondly, the blackbird was purchased from Aidan Campbell who unfortunately has no website but I can pass you his postal address and email. I found this with Google, Aidan Campbell: www.aidancampbell.co.uk/. It 's the same person? I want to find a canary. I very much think you're right! I've checked the Miniatura catalogue and all the other details match. Good luck with your canary. Oh, Irene, this is Magnificent!!!! Congratulations for you Patience and Persistence!!! 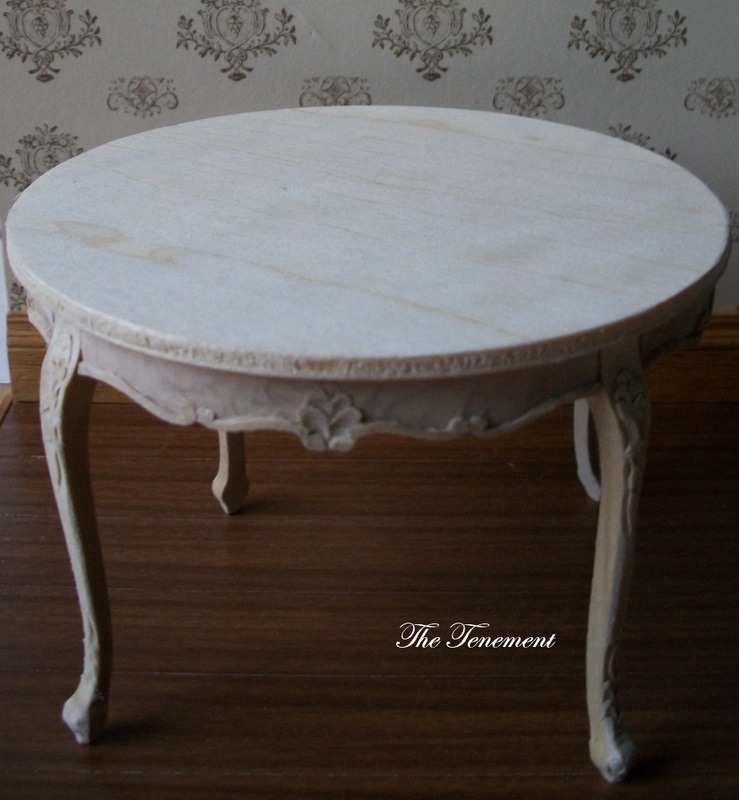 Searching has paid off... it is a truly gorgeous table!!! Fabulous table, love the details of the carving. Very elegant! It is a pretty table, I hope we will see it in the room. And your other purchases look really well made, the blackbird is a beauty. Your table is beautiful! Congratulations on you perserverance......it paid off! I too love the Blackbird. I have been looking for a pair of "Pigeon's" and hope that maybe this artist might have them. Thank you for sharing the source. I admire your patience and fortitude! That is a very beautiful table - just the right amount of carving not to be overwhelming... do you know who made it? 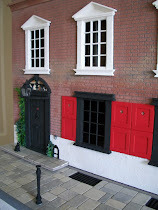 I am very envious of your jaunt to miniatura! One day I'll have to make it over! Just awsome! the table is beautiful and I love the detail...every item is lovely. The table is really beautiful and I love the blackbird. How many of these tables did you buy? or is it the same table at Hambleton Hall? Anyway, I really like it, it is an unusual style, and nice that you can choose the finish for it too. The blackbird is sweet, I think I have one very similar on my pub. It's always nice when you find just the right thing! I just love this table, it has been on my mind since i saw it on your Netherton post. It really is lovely. I love it in its raw state. The black bird really is lovely too. I have been wondering Irene how you do the watermark on your photos, I have been thinking about doing the same but have no idea how to do it. In any case, I find it perfect for your project. Congratulations Irene, The test of your patience has paid off, in your lovely table! I know that when you have a specific idea in mind there can be no substitutes. I think all of the items on the table are also very interesting esp. the bird. Many years ago, Restoration Hardware Store, were stocking Full-Sized blackbirds as decorative ornaments for the real life homes and I thought they were wonderful then; however Miniature ones are even better!